Gemma played international level netball for England for eight years so has first-hand experience of top level sport and the sports injuries that go with elite performance. She helped manage sports injuries in tennis and football players, judo competitors, fencers, basketball players and volleyballers in the British University Games in 2009. 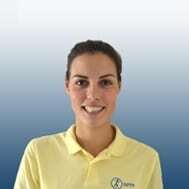 Since 2011 Gemma has been a senior physiotherapist in Poole Hospital NHS Trust, managing musculoskeletal conditions in adults and in the paediatric department for children from four years old to 16. Qualifying in physiotherapy in 2009, Gemma has become proficient in a wide range of physiotherapy techniques such as exercise programmes, joint mobilisations and soft tissue release techniques. She is registered with the Health and Care Professions Council (HCPC) and is a member of the Chartered Society of Physiotherapy (MCSP).